My brother, David, started the first Jean Machine store in 1975 in the Beaverton Mall (now known as Cedar Hills Crossing). 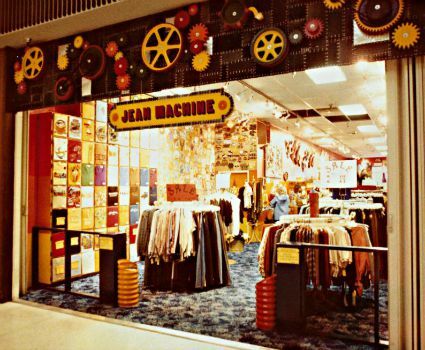 Jean Machine grew into a chain of at least 15 stores by 1983, located in Oregon and Washington. The chain’s growth was fueled by the popularity of denim jeans with unique embroidery on the back pockets. These jeans, along with t-shirts and other tops, drew teenagers to the stores. The stores emphasized service as well, and sales people would shorten jeans for the customers. I was one of the drivers that delivered the jeans to the stores in the cute Jean Machine van! I remember delivering to Hillsboro, Beaverton, and Vancouver Mall! I loved the Jean Machine & the clothes!